Who comes from the radioamatorial experience knows very well the emotion coming from the connection with a new country, especially if this is difficult to connect. Then, if is matter of NEW ONE the emotion easily becomes enthusiasm. The same thing arrives for RadioNature signals: sometimes the received signals can be so suggestive that their association to spatial origins can induce too much fantastic explications. Reality is more often more practical then suggestive. In this section it'll be analyzed a review of some signals that have very close origin to the listening point, but which appear as signal truly received. Those are the signals produced by the mechanic oscillation of the antennas. They are much present if antennas are wires and of big dimension and if they are under 50 Hz. The main cause of these oscillations is the wind. 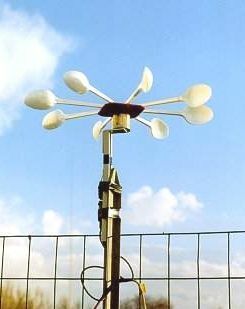 In order to correlate its presence with local signals the anemometer of picture has been invented, by using the little engine of an old recorder, eight plastic spoons and heated glue. The engine is dues as en alternator: the wind makes the spoons turn. That movement let the engine run. The more powerful is the wind the bigger is the amount of energy created and with higher frequency. The Anemometer is located on the base of the antenna which must be analyzed and it is connected, by two wires, directly to one of the two entrances of the sound blaster stereo. On the other channel is connected the antenna to be analyzed: a big horizontal loop. Antenna lay-out and interface circuit to connect big loop to the line input of Sound Blaster card. On horizontal loop of big dimension the wind effect is to make the loop arms and heads oscillate, at the same time it'll be reproduced in bigger scale what happens in a dynamic and moving coil microphone, the named pick-up effect. The effect is evident in the picture for frequencies below 40 Hz. Antenna and anemometer signal, compared in a 0-46Hz band in 9 minutes. The big T type antennas for the reception of the electric field, feel the effects of the same problem, behaving as an enormous electret condenser microphone which varies his capacity towards ground when is mechanically moved. Even here the correlation between wind and signal is obvious in frequencies below 20 Hz. To interface the antenna to the LINE input of Sound Blaster card has been used the circuits described in RECEPTION TECHNIQUES 2, by IK1ODO. 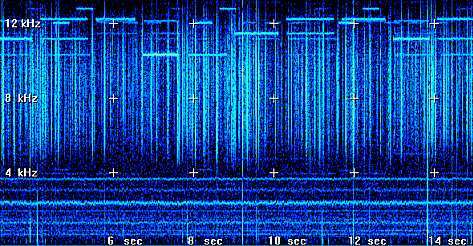 In the following spectrograms is evident a noise correlated to the mechanical effect of the wind: below the first Schumann resonance (7 Hz) a wide band noise with center in 2 Hz appears in correspondence of the anemometer movement. But the wind is not the only cause of these signals; sometimes other nice creatures, that go on in their life, can appear in our spectrograms. 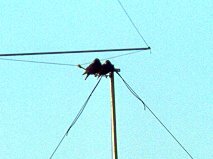 In the picture a family of blackbirds laying on an my T antenna arm at 11 m and here is shown the signal. They play, jump and bicker, moving the antenna's harms and changing the distance of the top hat to the ground. The same for the big horizontal loop, where they use the antenna spans like a swing. In the next picture 20 minutes spectrogram, 0 to 46 Hz band. Effect similar to the wind action, with peak signal at the same frequencies, but shows like tweeks in a uppers band. To the bird movements corresponds the vertical crops, like a strange spherics in a uppers bands. We can't truly say that these signals are of natural origin! Another source of fake signals comes from the domestic electric engines, like drills, washer, vacuum cleaner and other. They generate signals which propagate by using electric lines as antennas, spreading even many kilometers away. The picture show the mysterious signal, at the center of spectrogram, generated by my wife using the vacuum cleaner (800 W). Signals like this can be received in the middle of the country, a lot far from houses and industrial sites. Received with vertical antenna, 200 m of distance from noise source. Strong and clear the Alpha, RTTY and hum noise. The received signal appears as a carriers group at odd multiple of the main power frequency; the central frequency of this group (which is not visible), depends on round per minute of the engine and of windings number. Recorded at the top of 2600m mountain, with RS4. Historical image: Alpha and Omega are still present too (it was a 1994 summer). But take a look below 4 kHz mark: some RTTY are evident. Super receiver? Mega antenna? If you receive RTTY signals below 12 Hz you can be sure: the system is inter modulating. In the antenna preamplifier or in the sound blaster, the signal is directly saturating some devices which complains in this way. These signals usually correspond to the frequency difference of the two stations in saturation on the circuit and they can be of frequency even higher of the maximal sample of the used device: a time signal station on 60 kHz and a rtty on 62,4 kHz can for instance generate a intermittent rtty at 2.4 kHz. The solutions to this problem are two different: the reduction of the signal in entry and the application of low pass filters. During the storms the big T antennas are dangerous to use. They are like a big probe between the charged clouds and the hearth reference. Connecting a digital multimeter to the base of the antenna many thousand of volts can be measured. This charged can damage the input circuits of the radio receivers and produce a corona effects between the antenna and the insulators. This effects sound like a raspberry and is audible only with electric field receiver. The picture beside shows this effect in the right part of the spectrogram (received with big T), and in the left part the signal received by an active loop, placed at the base of T antenna. During this strange phenomenon, sensitivity of electric antenna at high frequencies decrease. If ever you have discovered the alien which you are now monitoring since two months, is in reality your neighbor's dishwasher: do not get angry. This will make your research in future even more serious and suggestive.